President Maithripala Sirisena yesterday said political leaders and all other stakeholders must determine to make Sri Lanka a powerful and prosperous nation in Asia that cannot be undermined. “We must be determined to build a prosperous and harmonious nationhood and also build a superior economy in Sri Lanka. “Therefore, we need to build a green economy that will contribute to eliminate poverty,” the President said. 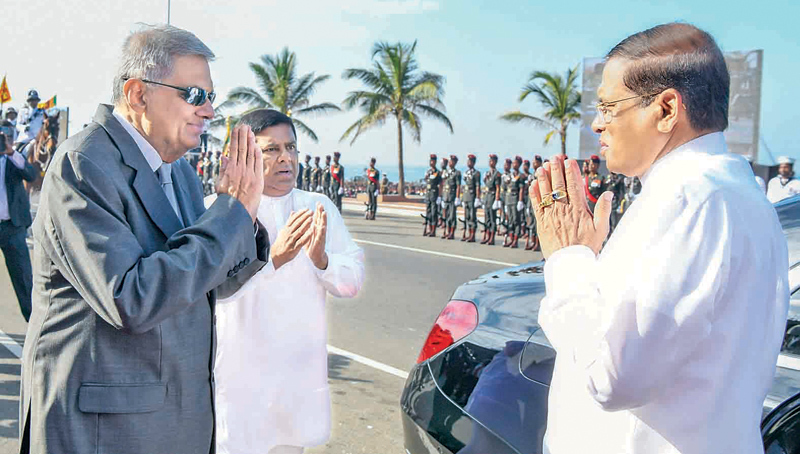 President Sirisena was addressing the nation at the 71st National Independence Day celebrations at Galle Face Green yesterday. “We need to build a green economy that will contribute to eliminate poverty. We need to introduce a system of checks and balances and a mechanism that strengthens Parliament to eliminate political anarchy through a proper election system. Furthermore, introducing the skills required for the state governance is very essential”. While lamenting that successive governments and politicians have failed to fulfill the people’s expectations, the President said “Since 2015, we completely removed the fear that was prevalent in the country. We won that situation. How difficult it is to remove corruption? I see a scarcity of honest politicians. Therefore, on the 71st National Independence Day, we must determine to make Sri Lanka a powerful and prosperous nation in Asia that cannot be undermined”. President Sirisena stressed that priority should be given to the elimination of corruption and malpractices in the country. “For that, we should be totally committed. Therefore, we should defeat drug trafficking and all rackets and illegal activities that create a black economy in the country,” President Sirisena said. “Also we must take prompt action to provide technical education, incentives and infrastructure facilities to help the country’s youth step into the future through new innovations. Our educational reforms need to be done immediately to create an educated nation. It is our duty to safeguard the cultural child and the technical child, I spoke of in 2016. We have to create the conditions for all the people to live under a single flag in an indivisible country that can never be divided. We must stay together,” President Sirisena added. The President went on to say that the people of the country were no longer ready to continue in an economic recession while experimenting on economic development themes and rectifying errant ways. “The political leaders who lead the country should be aware of this. The school education system, university education system and fundamental reformations of the vocational and technological education should be made in keeping with the international standards of the 21st century. Especially, the modern economical concepts of the 21st century, which is the economy of knowledge, economy of regeneration, Blue-Green economy, the digital economy and other economic concepts must be operated simultaneously in line with the United Nations Sustainable Development Goals,” President Sirisena said. The President also noted that the National Government formed in 2015 had rendered a great service to the country. However, most of the tasks that should have been done by the government were neglected and some things were done that should not have been done. While criticizing the behaviour of Parliamentarians within the House, the President said at present, the people see Parliament as a mirror image which shows the deterioration of the society. The President also noted that he saw the proposal about a National Government in the media and was against it. “It is necessary to ask how ethical is to claim the formation of a National Government by joining with a political party which has only a single Member of Parliament. I only see that as an attempt to increase the number of ministers and increase in the facilities of the ministers and MPs. From what I have seen in the media, I strongly disagree to the idea of proposed National Government”, the President added. The President said if the number of ministers is reduced to 25 with a single party running a government, he believed it, is the wish of the people. The President also recalled the services rendered by the War Heroes who made the supreme sacrifice in the 30-year conflict, the disabled War Heroes and members of their families. “Two Sri Lankan War Heroes serving in the United Nations Peacekeeping Mission died last week. I express my condolences over their demise on this occasion and extend the honour of the whole nation to their families,” the President added. A group of youth and Security Forces personnel with national flags and the golden lion at the start of the Independence Day parade. 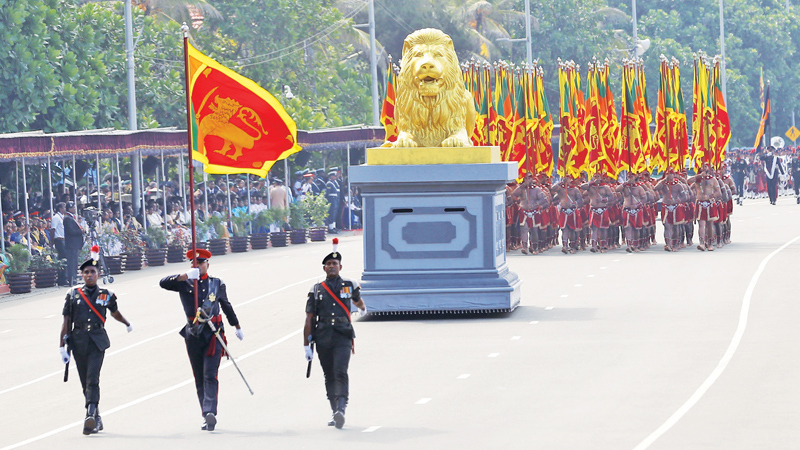 The 71st National Independence Day of Sri Lanka was ceremoniously held at the Galle Face Green yesterday under the patronage of President Maithripala Sirisena and Prime Minister Ranil Wickremesinghe. Maldivian President Ibrahim Mohamed Solih and his wife attended the celebrations as the Guests of Honour at this year’s National Day celebrations. Opposition Leader Mahinda Rajapaksa, Speaker Karu Jayasuriya, and many other parliamentarians, diplomats and military officials attended the event. At the Galle Face, the main ceremony comprised of a march-past by 5,848 members of the three Armed Forces. Among them were 3,872 members of the Sri Lanka Army, 932 from the Sri Lanka Air Force and 1,033 from the Navy. There wers also 922 Police and Special Task Force officers. About 500 from the Civil Security Department and about 100 cadets also took part in the parade. Navy Spokesman Lieutenant Commander Isuru Suriyabandara said 16 ships and craft had participated in the National Independence Day celebrations. Showcasing our ancient Culture, dancers of the Sabaragamuwa, Vavuniya, Akkaraipattu, Southern Provincial Council and National Youth Services Council provided extra glamour and colour to the event, in addition to displays of Army parachute jumps, Gun salutes and Air Force demonstrations. Speaking to the Daily News, Air Force Spokesman Group Captain Gihan Seneviratne said 49 Officers, 743 Airmen and 103 Airwomen joined the ceremony to present their salute to the President. Further, the SLAF aircraft fleet performed a spectacular National Day Fly-Past and the newly formed “Blue Eagles” Aerobatics Team also made an appearance for the first time during the parade. The Air Force Spokesman said among the aircraft that participated in the Fly-Past were three Bell 212, two Bell 412, four MI17, five Cessna 150, five PT6, four Y12, a B200 beach craft, a C130, an Antonov AN32, MA60, three K8, a Kafir and three F7. The Air Force Spokesman said for the first time there was female representation included in the Tri Forces Regimental Special Forces Independence Special Parade. Further the sky rope display was also a new feature in this parade.